You likely devote one to three steps of your nightly skin care routine to removing product, sweat, dirt, and other impurities from your face. Have you ever thought about how much of the same stuff builds up on your scalp every day? In the summer months especially, when your hair is exposed to chlorine, sea water, sunscreen, sweat-inducing temperatures and lots of dry shampoo! A lack of scalp maintenance can result in dandruff, an itchy scalp, infections, and a series of undesirable scalp conditions. 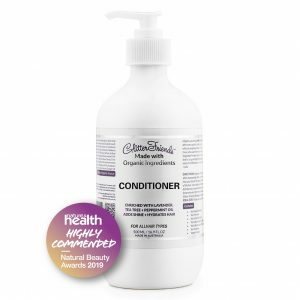 Uncover your hair’s natural beauty by switching to an Australian Certified Toxic-Free®, Made Safe® and Allergy Safe Certified® alternative and leave your hair and scalp nourished and looking its best. 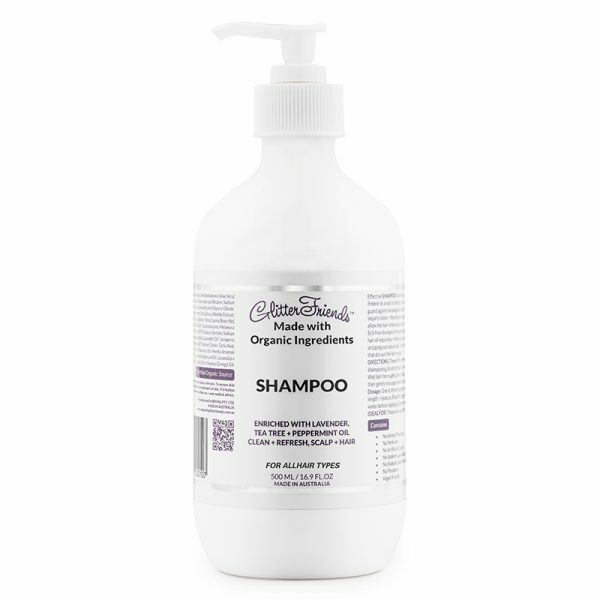 You’ll noticed this Shampoo cleans out your scalp, so you left with a healthy scalp that feels beautifully clean and hair that isn’t stripped. Glitter Friends natural hair products are great for children, your whole family can have squeaky clean, nourished hair! DIRECTIONS: Three to five times weekly, prior to shampooing, brush dry hair to loosen dirt and disentangle. Dosage: One to three teaspoons, depending on hair’s length and texture. Wet hair thoroughly, pour product into your hands, then gently massage onto the scalp. Rinse thoroughly and squeeze out excess water before applying Glitter Friends Hair Conditioner. Avoid contact with eyes. To ensure skin compatibility test product on a small patch of skin.